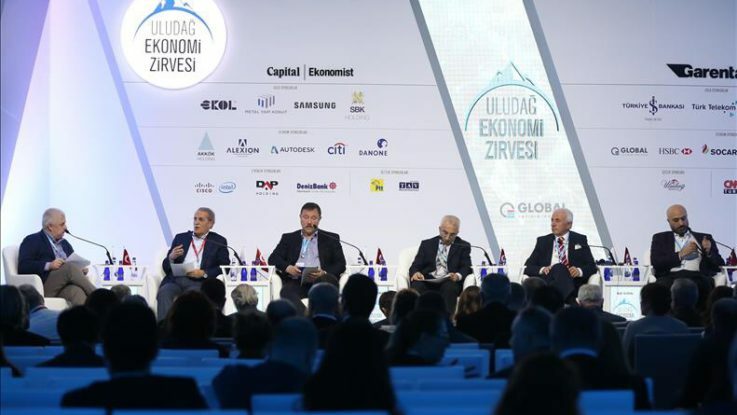 Infrastructure investments should be deemed as the driving force for sustainable economic development and a source of motivation for our country, head of a prominent Turkish contractor company said on Saturday. Attending a session on the second day of the Uludag Economy Summit in northwestern Bursa province, Ibrahim Cecen, Chairman of IC Holding which is heavily involved in Turkey’s mega infrastructure projects like Istanbul’s Yavuz Sultan Selim Bridge, said continuous infrastructure investments were needed for a solid and strong economy. “Infrastructure is one of the key components for the welfare of the societies. Such investments should be deemed as the driving force for sustainable development,” Cecen said. “In 2016, during the G20 meeting in Shanghai, OECD Secretary General said that in the upcoming 15 years $93 trillion would be invested for the global infrastructure,” he said. Detailing the investment requirements, Cecen said the need for the infrastructure investments were worth $26 trillion for the Asian continent up until 2030, according to the Asian Development Bank reports. “We have to make those investments sustainable. Besides their contribution to the economy, they have also a positive effect on the morale and the motivation of our country,” he added. Cecen noted that Turkish banks’ financial capacities and priorities to give huge support for such projects in favor of the country’s development had increased in the recent years. “Their positive attitudes provide great advantages for us. I would like to say that clearly, we do not have any problems to reach financial tools not only in Turkey but also in the global scale,” he said. On March 16, Turkey signed a deal for the country’s most recent mega project, the Canakkale 1915 Bridge spanning over 2,000 meters between Lapseki and Gelibolu in the northwestern province of Canakkale. The ‘longest ever suspension bridge’ in the world will be constructed by Turkish and South Korean firms through BOT model. Last year, Turkey completed a lot of BOT and PPP infrastructure projects planned as part of a series of objectives for the country’s centennial in 2023, including $1.3-billion earthquake-resistant Osmangazi Bridge over Marmara Sea as a part of new six lane Istanbul-Izmir highway. Istanbul’s Yavuz Sultan Selim Bridge over Bosphorus, which cost nearly $3 billion to construct, was opened last August as the world’s longest suspension rail bridge in its class. Last October, on the 93rd anniversary of the founding of the Turkish Republic, a new $235-million station for high-speed trains in the capital Ankara was inaugurated to provide services to 50,000 passengers a day. The Eurasia Tunnel, the first road tunnel constructed underneath the seabed of the Bosphorus, was opened last December to significantly reduce travel time between Istanbul’s Asian and European sides. Construction of the titanic infrastructure project took over four years and cost $1.3-billion.